Two NYPD officers died in a late-night crash after celebrating one of their weddings at a resort in the Catskills; a third person was hurt. Ida Siegal reports. An NYPD officer who had just gotten married died along with an NYPD detective when their rented Maserati veered off the road and flipped into the woods after the wedding reception in the Catskills late Sunday, authorities say. Michael Colangelo, a 31-year-old NYPD cop from Huntington Station, was the groom. NYPD colleague John Martinez, a 39-year-old detective from Hauppauge, was initially thought to be behind the wheel of the Maserati on Oliveria Road in Shanadaken when he lost control and smashed into a tree just before 11:30 p.m.. But New York State Police later said that may not be the case. "That's one of the things we're going to try to determine with the autopsy -- the nature of the injuries and the point of impact will tell us more," said NYSP Major Pierce Gallagher at an afternoon news conference. The Maserati flipped over after hitting the tree, then came to rest on its roof. 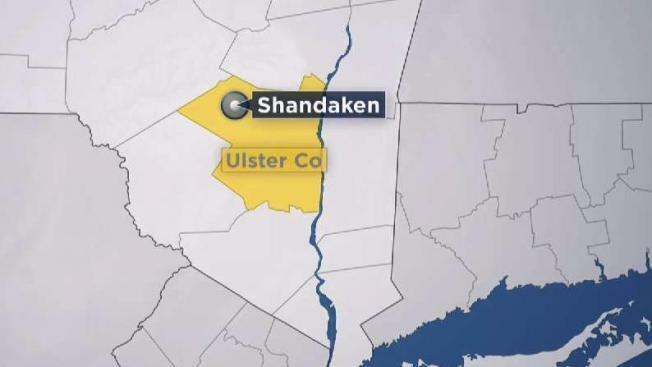 A third occupant, a male civilian, in the car was taken to a hospital with a serious head injury but is expected to survive, New York State Police said. Both officers were off duty at the time of the deadly crash, which was only about a mile from the venue where they had been celebrating Colangelo's marriage. A cause is under investigation; autopsies, including toxicology results, are pending, investigators said. State Police said the two men who died were not believed to have been wearing seat belts; the lone survivor likely had his buckled. State Police also say the road where the accident happened is a narrow, 40 mph county road with some curves -- and given the nature of the deadly crash, which involved an extreme rollover, they were likely speeding. The extent of that speed, though, remains under investigation, State Police said. Chopper 4 over the scene Monday morning showed clear skid marks on the rural road hours after the accident. They jerk suddenly off the pavement and head into a wooded area, where the track rapidly disappears into thick brush. Emergency radio showed the desperation of the response: "There's no one moving inside of it or around it ... fire department en route." Sources say the officers had been celebrating Colangelo's wedding at Full Moon Resort, which bills itself as a rustic venue in the "'Forever Wild' Catskill Mountain Forest Preserve and Hudson Valley of upstate New York" on its website. State Police responded to the scene, along with at least a half-dozen other departments and agencies. News 4 has reached out to the NYPD for comment.